Kids all over North America dread waking up in the early hours of the day so they can go to school to get an education. Most of them find it boring and unappealing to them and find that it doesn’t meet their interests. However, when you get to visit or even take a look at the Third World, you realize that kids all over the world have the desire to learn and do whatever it takes to give them the better and brighter future that they have always desired and have been willing to work for their entire lives. Seth Stammler, former member of the MLS’s New York Red Bulls and the winner of 2010 MLS W.O.R.K.S. Humanitarian of the Year Award, has recognized all of the situations that are going on in Haiti and is doing whatever it takes to help change the country. He started up the Sporting Chance Foundation in 2007 after his first trip to Haiti in 2006 where he helped out with Yele Haiti, the Foundation created by Haitian born rap-star Wyclef Jean. Stammler and some of his Haitian born teammates, Jozy Altidore and Jerrod Laventure, took part in a number of soccer clinics with underprivileged youths and children from a local orphanage. Aside from playing soccer, they conducted a number of clothing distributions, which included passing out gently used clothes that were collected back at home in the United States. When Stammler witnessed that the people in Haiti struggle for some of the most basic necessities, he made the decision to pursue water wells as one of the primary initiatives of Sporting Chance Foundation, a non-profit organization dedicated to improving the lives of those living in Haiti. They have decided to help build wells in the most accessible locations throughout Haiti since both the fully capable and the crippled were travelling for 15 miles to find clean, useable water for their families. Each well will provide nearly 10,000 people with water and will hopefully help put a stop to water-borne illnesses and make a noticeable impact immediately. Aside from the lack of necessities in Haiti, Stammler also realized the children’s love for learning and saw how badly they wanted to go to school. With education being introduced into the community, the kids of Haiti are hoping to use their education to turn their lives around and maybe one day become a community leader, rather than being a gang member for the rest of their lives considering that the gangs in Haiti provide more resistance and have a strong hold on the community. Stammler has won the team Humanitarian of the Year Award four times and also helps out around his own community. He helps out at his local YMCA where he participates in clinics for underprivileged children throughout the New York/New Jersey metropolitan area, as well as his native Ohio. Aside from helping out around his own community and helping with his own charity, Seth Stammler also helps out and donates his time to Athletes for Charity. Other athletes, such as Andrew Ference of the Boston Bruins and Jason Collins of the Atlanta Hawks, have jumped on board with Sporting Chance Foundationbecause the athletes know just as well as we do, nothing can be done alone so the more that decide to lend a helping hand for problem, the more of a chance we have to change more people’s lives. To find out more about Sporting Chance Foundation, visit http://www.sportingchancefoundation.org/about.php. 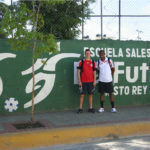 To find out more about Athletes for Charity, visit http://www.athletesforcharity.com/about_us.php.